After 15 years of service for SWISS, the Avro RJ100 will complete its final flight to Canada, where it will be passed back to its original owner. Aircraft Engineer Kyle will be joining three SWISS pilots on board this sentimental Avro flight. Kyle has been working as a B1 aircraft engineer for the SWISS family for almost ten years. "I love my job! Changing engines and landing gear, carrying out verification flight...I can think of nothing better!" The withdrawal of the Avro from service is a special moment for Kyle. "Our team has been working on the HB-IXT for more than two weeks – and now we get to fly her back to Canada ourselves. No words can even describe the experience." Besides carrying out a range of different technical tests before the flight, the necessary documents need to be prepared and bureaucratic hurdles overcome. "We will have to deal with Customs in Canada. Of course, they'll want to know who we are and who we are handing the aircraft over to. The pilots will have all the necessary paperwork with them for the transfer flight." The big day has come – the Avro is flying back across to Canada. Various final tests need to be completed before take-off. The plane is being fitted with a new airbrake in the hangar in Zurich and engine number two requires replacement. "I'm carrying out the final inspection of the new engine before we test it." The Avro is finally ready for testing. "Because this is relatively loud, the plane is moved into the Silencer. 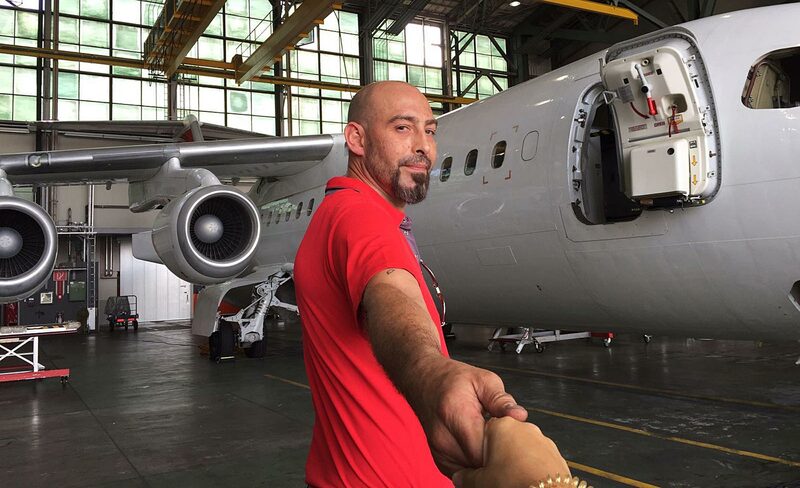 I sit in the aircraft tug when this happens, so that I can make sure that everything is okay." HB-IXT's new engine will be opened up to check for leaks – Kyle sits in the cockpit. "I start up engine two for an initial leak test." Two inspectors then carry out an external check on the engine. This also includes checking the oil filter and chip detector for deposits. Then a high power run is performed to ensure the engine is capable of making take off power. It's time to get in the cockpit! «Reto Scheidegger sits on my left and Kevin Fuchs on my right – the two SWISS pilots who will be on the transfer flight. I'm sitting in the lookout seat. Due to the long period spent on the ground and the different parts and engine that have been replaced, I need to make sure that all systems are working properly." The tests on the ground are now complete. The Avro is almost ready for take-off. "Before we can start the long flight to Canada, we need to carry out one last verification flight." Once the plane has successfully passed the inspection flight, it is ready for the transfer. "Reto, Kevin and I are all ready for take-off and will be heading off to Canada soon." There's still enough time left for a team photo though! And whilst we're at it, we'll quickly take a photo with Paul Gregg, another SWISS technician. Before taking on a management role, Paul used to work as an aircraft mechanic and spent years working on this type of plane. We can't miss the chance for one last photo with the Avro." It's now time for take-off! The flight from Zurich to Summerside, Prince Edward Island in Canada, takes more than ten hours. "I'm in the cockpit during take-off and landing...sitting in the jump-seat. That's the middle seat, behind the others. I watch the displays from here and make sure that all parameters are as they should be." Once the plane's in the air, there's coffee and breakfast to be had. "I'm ready to jump back into the cockpit at any time. If there are any problems, I'm back in the cockpit like a flash to see what's wrong." "When we've arrived in Canada, I'll remove the temporary registration code for the next customer. The Avro will be getting a new registration code soon, of course." Just one last quick photo, and then it's time to say goodbye. We wish you well, Avro!